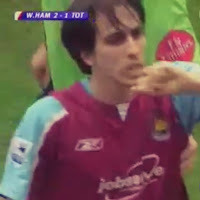 On the day that Spurs revealed that their top man Harry Kane will be out for the rest of the season, fans were reminded of a similar disappointment for the Spuds as ex-Hammer Yossi Benayoun announced his formal retirement from football at age 38. The 'Diamond' arrived to the Premiership from Racing Santander in 2005 to join the Alain de Pardeux 'revolution' at Upton Park. He went on to play for 72 games in the following two seasons before moving to Anfield. A creative midfield force who liked to hang off the striker, Benayoun delivered 8 goals over the two seasons, appearing in the 3-3 FA cup final of 2006. His final game was the Old Trafford 'Great Escape' of 2007. However, it was the final game of 2006 that will be best remembered by West Ham fans as he scored the winner in a 2-1 victory over biggest neighbours that prevented Spurs from making a much-coveted 4th place and denied them a Champion's League spot. With Arsenal and Man United breathing down Tottenham's necks for that 4th place spot this year, what are the chances that with Kane out of the picture that West Ham will repeat the 'favour' when they visit the new White Hart Lane in a fortnight? With a great footballing mind and considerable leadership qualities having been National team captain for Israel for much of his career, Benayoun will surely have a crack at management? Either way, we wish him the very best of luck in the years ahead. I see you are looking forward to your 'cup final'. Just another game for us! Why insist on using the word "Spuds"? Should we always call you guys "Wet Spam"? OK, why didn't WetSpam beat Chelski? BTW, your captcha images are too small and somewhat fuzzy. I had to go through Captcha about 8 times before the post was accepted.